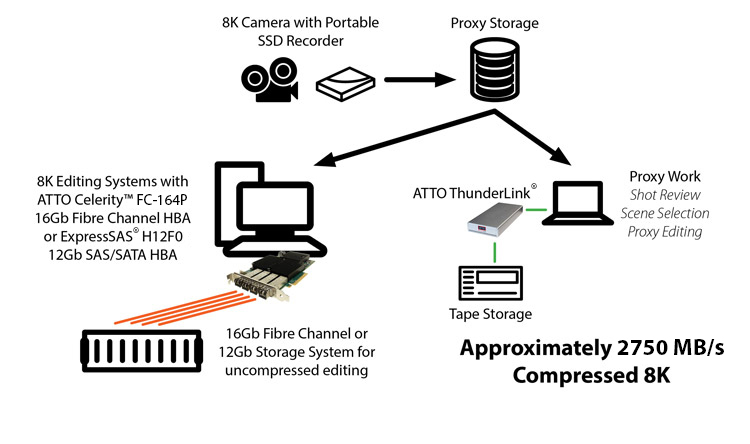 ATTO's Thunderbolt Technology-enabled ThunderLink Adapters bring high throughput (40 Gb/s) and	versatility to creative professionals who need access to external storage and networks for	I/O demanding applications, including 8K/4K Ultra High-definition video workflows. They also	provide access to LTO tape storage devices for data migration between field and studio. With	ThunderLink adapters, a single Thunderbolt cable can provide connectivity to 40Gb Ethernet, 32Gb	Fibre Channel, 12Gb SAS, USB and DisplayPort, as well as extend connections to other	Thunderbolt Technology-enabled devices. Advanced Data Streaming Technology (ADS) provides for controlled latency and acceleration of data designed to deliver multiple streams of video concurrently without dropping frames.